The kitchen is where the most important magic of a family happens. It’s where parents make their kids’ favorite meals, where families gather for a dinner, where children learn to bake and have fun. Spacious or compact, your kitchen is where you and your family spend a lot of time together. However, your kitchen can become quite suffocating if you don’t have a range hood to take out all the unwanted smells, smoke and food particles out of it. Everything can accumulate inside the kitchen and around your home without a range hood directly above your cooking range, making you and your family cough and sneeze. That’s not all, breathing in these harmful smoke and odor can actually cause health problems in the future. There are a number of range hoods available in the market that you can use in your kitchen. It all depends on your kitchen’s size, location, cooking range and cooking habits. The most common ones are discussed here below, so that you can decide on the right one for you. The main idea for a kitchen range hood is to carry out all the steam, smoke, odor and minute food particles from your kitchen while (and after) cooking, so that your kitchen always stays fresh and smells nice. Now, the range hood that will be perfect for your kitchen can be differentiated based on size, material, location of installation, etc. These range hoods are small and compact, just the size of your cooking range. They are hung under the cabinets above your stove or cooking range, and they directly capture the smoke and smell from your cooking. They are especially designed to blend in with your cabinets; actually, they are best installed at the same time as your kitchen cabinets are being made so that your cabinets can be built around the hood without wasting any space. These under-cabinet range hoods are the most common ones that we see in an American home, and they can actually be of two types: with or without a duct. The ducted range hoods capture all the smoke and smells and carry them through the ducts, releasing them outside. The ductless range hoods, on the other hand, don’t carry the unwanted smoke and pollutants, they filter the dirty air, giving it back into the room, clean and fresh. Both ductless and ducted under-cabinet range hoods are the most common designs you can find in a home. They are available in a number of designs and sizes, so you can easily choose one that suits the theme of your kitchen. Ducted range hoods are great for larger kitchens or kitchens that undergo continuous cooking. If you love to cook or if you cook a lot for your family, your kitchen will produce a greater amount of dirty air that a ducted range hood can clean more effectively. They are not just filtering or cleaning the air, these range hoods are actually taking out everything bad in your kitchen and taking it out of your home. They run more quietly and more efficiently than any other type of range hoods. Ducted range hood of course need access to ducts, which aren’t really available everywhere. If you didn’t have ducts installed in your home during construction, you can’t really use a ducted range hood. These range hoods are more convenient to install, more versatile and more compact. You can install them anywhere in the kitchen as they are independent appliances that doesn’t need to be connected to any ducts or vents. They are perfect for medium-sized kitchens with moderate cooking. They take in the dirty air, filter and clean it, and release the same air in your kitchen. Remember, ductless range hoods are taking in your dirty air and filtering it, not removing it completely. Therefore, your kitchen can actually become a little humid if there aren’t any windows around. Besides, these range goods are also loud and need regular cleaning. The filters may also need changing every now and then because the dirty air will clog them. These range hoods aren’t installed with your counters, but are rather large hoods that take up the entire space above your cooking range. That is, a wall-mounted range hood is installed over the cooking range instead of cabinets. They usually come with their very own chimney where the dirty air is sucked into and led outside. The vents are attached to the exterior wall where the dirty contaminated air is released, keeping the kitchen clean and fresh. Pros: Wall-mounted range hoods are large enough so that they can completely clean your kitchen’s dirty air. The kitchen won’t be humid or wet, and there wouldn’t be any lingering smell or smoke of your cooking, even when you don’t have enough windows in your kitchen. Cons: If you have a small kitchen, installing a wall-mount will only reduce the number of cabinets you can have. If you install a wall-mount hood, you won’t be able to install cabinets in the area over your cooking range. Besides, they need to be connected to an exterior wall of your home. If your cooking range isn’t installed on an exterior wall, you cannot install a wall-mounted range hood. Island hoods are needed when your cooking unit is on an island in the middle of your kitchen, not on any wall. They are designed just like a wall-mount hood but they hang from your ceiling just over your cooktop. Pros: If you have a large kitchen with a cooktop island, an island hood is the perfect way to add some value to your house. They are expensive, but they look very beautiful. Cons: Island hoods need to be connected to vents inside the ceiling, which is not always possible. If you are planning to have an island cooktop range, you need to install the vents while constructing the house. 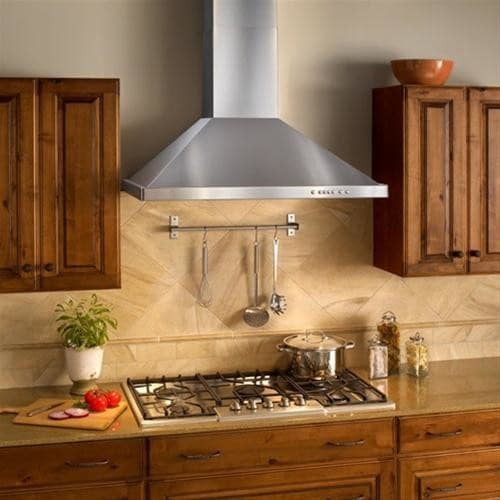 These kind of range hoods are not very common in a kitchen, but you can invest in one because they are quite effective. Downdraft ventilation hoods are a kind of exhaust fans that come with a cooking range, hidden inside. It is only used when needed, not all the time. If the kitchen air starts to get humid and smelly, you have to turn on the fan. When not needed, the fan stays hidden inside the cooking range. Pros: Downdraft ventilation hoods are perfect for small kitchens that doesn’t have space for a separate range hood. These hoods are hidden inside the stove and doesn’t need extra space on your walls or cabinets. Cons: The problem with these range hoods is that, if they break down, you might have to replace the whole cooking range instead of just the hood. This is an additional cost that is not welcome in most homes. Instead of a whole range hood, some people just install a ventilation fan on their walls. They are compact and convenient, and just need a power source to operate. They can be installed anywhere in the kitchen, not just near your cooking range. This is a simple fan that you can install within your kitchen walls or against a window so that all the contaminated air can be pulled outside the house. Pros: You don’t need much preparation in advance to install a wall ventilation fan in your kitchen. You can just install one as an afterthought if you don’t have any ventilation system in the kitchen. Cons: Wall ventilation fans are somewhat effective against smoke in the kitchen caused by cooking, but nothing more than that. If you use a wall ventilation fan in your kitchen, you might still have to worry about grease in your walls and humidity in the air. You are definitely going to need a good ventilation system in your kitchen, no matter which one you try. 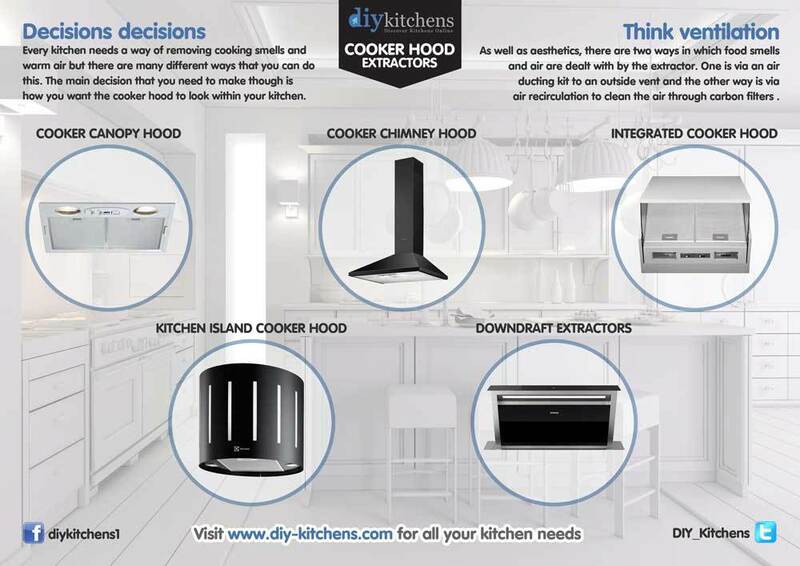 Different types of range hoods and ventilation systems are available in the market for you to choose from, depending on your kitchen type and need.